Form Description: Any pet owner will admit that their pet is a vital part of the family, and as such they too should be kept in the best possible health. One of the best ways that you can do that is by keeping track of their health history like you would with any other family member. That is where this Pet Health History form can be a huge help. This form will allow you keep a clear record of all veterinarian visits, what they were for, and any medications that were taken, and even more. Definitely a good idea for any pet owner. 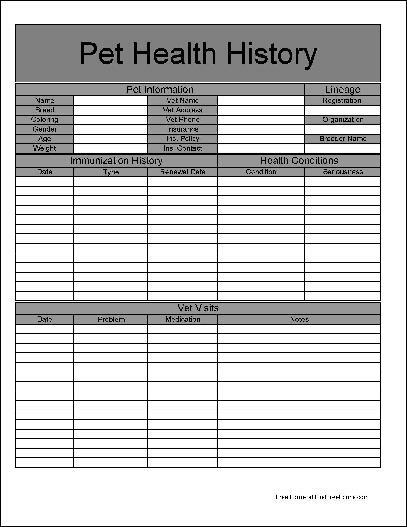 This form ("Basic Pet Health History") is associated with the following keywords: Medical, personal, pet, medicine, veterinarian, visit, history, log, tracker, basic.